Bubu hostel Zagreb is a happy and relaxed place in Zagreb. When you feel like going out of bed, you can enjoy our free sauna, free mini fitness centre, hang with us at the reception or chill in the common area. We offer dormitories and private rooms. We will give you free brochures and give you all the info about Zagreb and what's new in town. Come to Bubu hostel and make yourself at home! 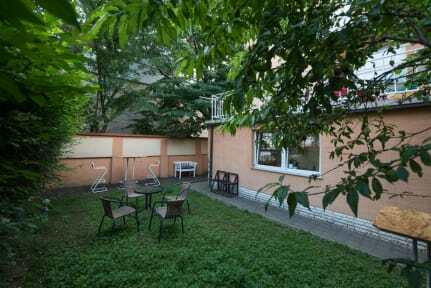 Our hostel is centrally located near the Kvaternik square and within a walking distance to 'Old Town of Zagreb' and Zagreb's beautiful park 'Maksimir'. With the transportation right to our doorstep, Zagreb is accessible and easy for you to explore! Bubu hostel Zagreb has the perfect accommodation. All rooms at the hostel feature with nice and comfortable bed with curtains to have your privacy. We provide female, male and mixed dormitories with shared and private bathrooms. If you prefer even more privacy, we provide private rooms as well. We don't just offer a clean bed, we offer your little private paradise in unique beds where you can enjoy total privacy. Check in from 12:30 to 23:00. City tax not included - city tax is 10 HRK per person per night. It was the best hostel that I have ever stayed in. We stayed in a room for 6 people but the design of the room was in such a way that we felt that we stayed alone. Everything was cleaned and the guy in the reception was really friendly and at the end of our staying he gave us a souvenir. Also the location of the hostel was perfect because there are trams if you want to go to the city center or the central bus station next to it. I definitely recommend it!!! Recommend! Great,friendly staff,clean bathrooms,comfortable spacious beds.Would stay here again! One of the best hostels I have stayed at. Very well run. Hospitality is absolutely amazing. Ability to chill out or go out easily. So many recommendations of what to see and do and some very good times with hostel mates and staff. Beds are amazing, very private. New sauna. Highly recommend! So far my best hostal experience. The staff is incredibly friendly and they truly make you feel at home. They also offered me free food and drinks everyday, including some other stuff good stuff 🌿 ;) Plus, the beds are super comfortable and allow you to have some privacy, and not many hostels have this. Bubu hostel is one of the coziest places I've ever been. The place is very clean and because of the beds that look like capsules, I had really good privacy. Owners are very nice and helpful. There is also a kitchen where you can put your own food and have free coffee and tea as well. I enjoyed my stay very much! Small, caring staff makes Bubu feel more like a home than a hostel. Before I was even checked in I was offered a drink and made to feel welcome. 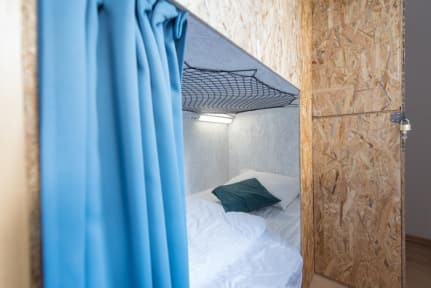 Bunks are very comfortable and private, though can be stuffy—with no fuss at all I was moved to a lower floor and bunk so my bed would be cooler. Locks provided for their big lockers. Thanks y’all, enjoyed it very much! Very friendly and helpful staff with good facilities. Only 20-30mins walk from the centre or close to the trams. Our room was smaller than expected but had everything we needed and it wasn’t a problem for us. Overall lovely stay! Overall this place was really nice. Pros were the cleanliness and privacy, plus towels and lockers provided for no charge. However, the distance from center city was further than expected, the door was unlocked from 8-11 (I would've preferred it to be constantly locked) and it was hard to find the staff at times. It was very close to Maksimir which I thoroughly enjoyed. I did still enjoy my stay here, just be prepared for a long walk downtown and a somewhat individualistic environment.